Rashford started from the wide on the night and regularly switched places with Lukaku to pop up on the left at times. His movement and speed always gave Chelsea a lot of problems and he took the game to the opposition with his pressing and running. As Mata dropped down, Rashford drifted into the middle and kept the Chelsea defense under constant pressure. 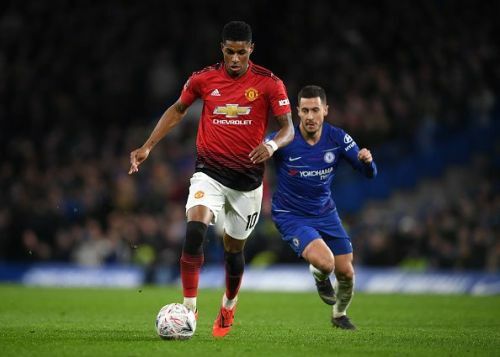 Due to the nature of Chelsea's game, United were constantly under pressure in the first half, but whenever they had the ball, Rashford's abilities on the ball and his speed down the flanks always looked threatening. Due to his movements, Marcos Alonso was unable to play his natural game, as the Spaniard had to keep an eye out for the United youngster. Just at the stroke of halftime, Rashford had his moment of the night. He received the ball from Pogba and ran through the right flank. He had the presence of mind to wait until Pogba arrived and then fed the Frenchman with the perfect cross. Pogba scored United's second of the night and won the game.